Cannova plants are shorter than your average canna, making them ideal for every garden, including small patios and urban gardens. 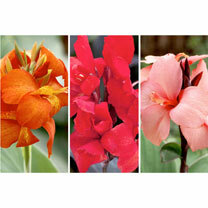 They come in a range of tropical colours and bloom over an impressively long period! Flowers May-October. Height 70-80cm (28-32"); spread 30-40cm (12-16"). You will receive 3 x 2 litre potted plants, varieties selected by us, for only £15 - bringing a luxuriant addition to your garden! Please note: Image for illustration purpose only. A canna for our English climate!